The Winter Solstice is my favorite holiday. There’s so much incipient hope in the turning of our earth back toward the light on the longest night of the year. I also adore that “solstice” literally means “standing still.” As the sun seems to change direction it hangs, seemingly stationary in the sky, for the days in between Solstice and Christmas. So perfect how the ancients and then the Christians made note of this most essential of all turnings. And if you’re in the southern hemisphere, you’re experiencing the turning toward winter at Summer Solstice. Nevertheless, you can celebrate that with something golden too, even if it isn’t a cooked Shepherdess Pie. Sometimes I think I should call my blog Happy Accident. So many of the dishes I share with you come out of serendipitous all-of-a-sudden and what-if–and when I’m not worrying about how something is going to come out. 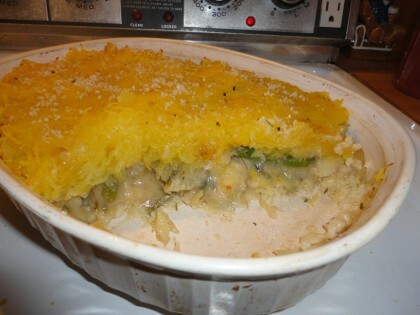 There are plenty of good vegan shepherd pie recipes out there. Two of my favorites are Susan’s Skillet Gardener’s Pie and Nava’s Hearty Lentil and Mushroom Shepherd’s Pie, which both use a mashed potato topping. I love mashed potatoes almost as much as the most die-hard potato lover over at the McDougall site, but I confess I love winter squash even more. So I’m always looking for ways to use it in my food. Especially if someone has given me a big beauty from the garden and I’m all by myself. Thanks to Anne Esselstyn and the recipes in Prevent and Reverse Heart Disease (the first book), I learned that adding cooked butternut squash to mash potatoes makes a great twice baked potato. That’s all the encouragement I’ve needed to place my toes on the edge of the diving board and go head first into trying squash as a topping for this Shepherdess Pie. I knew something meaty like butternut squash would work well paired with potatoes, but what about spaghetti squash? I had a whole big one to use up. It’s lighter than potatoes or other winter squash but then I remembered how good it is as a layer in Susan’s Spaghetti Squash and Pesto Lasagna. It’s only a hop, skip and a jump to put it on the top instead of on the bottom and the middle, so I jumped (hopping and skipping first, of course) at the chance to try it. I wanted a light and bright casserole to cheer up these dark, short days. 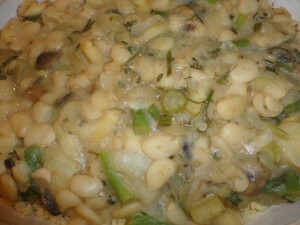 I had a lot of white vegetables on hand and some baby lima beans to try. And I wanted a light sauce. I wasn’t disappointed with any of the results. I took some photos, half-heartedly thinking they would not turn out, but they are okay enough that I can share this as another easy holiday strategy with you for a hearty and pretty meal that comes together easily and that is as cheerful as the sun breaking through the clouds on a winter afternoon. I’m so glad this golden opportunity really did bake up golden. I’ll give you the basic strategy so you can play with whatever ingredients appeal to you or what you have on hand. First stab the whole spaghetti squash all around it and then put the whole thing in the oven at 400 on a baking sheet or shallow dish lined with parchment paper. Roast until it is soft to the touch, usually an hour. You can let it cool whole a while if you like. (It helps the strands develop and you’re less likely to burn your fingers from the steam when you scoop the seeds out. Take a walk or something. Wrap a present or two. You can do this the night before. Just scrape the squash out and store it in a container in the fridge until you’re ready to assemble the pie. Prep your veggies. 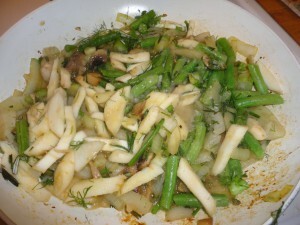 Slice up the fennel, julienne the parsnip, snap the ends off the beans and break in twos or threes. Pull the thyme and rosemary off their stems. Here’s what all that looks like in the pan. Heat a little of the bean broth in a skillet until it comes to the boil and saute your veggies, then cover and steam them just until tender. Add the sauce and the beans and stir on low heat until all is combined. Add more herbs or seasoning to taste. Spoon into a baking dish. Top with a sprinkling of crushed sesame seeds and some pepper if desired. Spoon the spaghetti squash over the top of the filling. Top that with a sprinkling of crushed sesame seeds as well if desired. Or smoked paprika, Or black pepper. Or extra rosemary or thyme. Notes: If you have some cooked leftover millet, you can mix it up with some garlic (roasted is nice) or garlic granules and press it into the bottom of the pan before adding the veggie-bean mixture to make a thin crust. This is the kind of thing that tastes great right away even better with every passing day, so don’t be afraid to make it ahead of time. A long time ago one of Mike’s friends went home after hearing me talk about the Solstice and told his Mom he wanted their family to celebrate it. She told me she said okay and “just made a lot of yellow food.” We laughed, but actually I think eating food the color of the sun-colored food is a fine way to honor the sunlight and also the light of spirit we need to see our world through dark times. A sense of play is gold when it comes to riding out the dark. And not just when it comes to food. Last Spring I found this globe on the lawn outside an apartment building the week all the students leave for the summer. Someone had either forgotten to stick it in the back of the car, or, more likely, tossed it. It was fun to save a world. 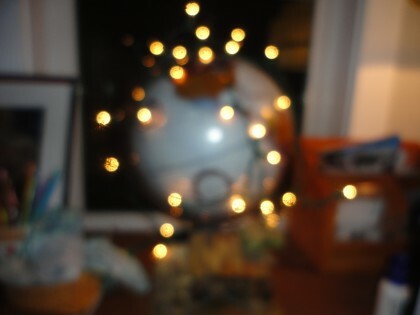 And now, at Winter Solstice, it seems to me our world needs to be wrapped in light. So that is just what I did. Saving the world one plant-based recipe at a time–that’s you, Maria! This looks delicious. Happy Winter Solstice to you! I can’t agree more that our world needs to be wrapped in light with the coming of this Winter Solstice celebration. AHHHH!!! I CAN EAT THIS ONE!!!!!! I’M SO EXCITED!!!!! OK, I’ve calmed down a bit. Good looking out, Pam! 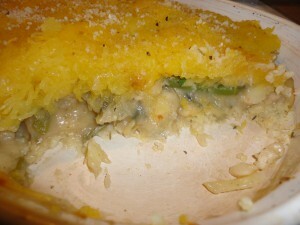 I agree – “Shepherdess” pie rules! I’ve never celebrated the solstice, but perhaps I should. This looks filling and tasty, and a good way to use spaghetti squash, which I never really know what to do with. Spaghetti squash can be topped with any sauce you would use with pasta. I usually top it with simple marinara and add lots of mushrooms for extra texture.